We all have some characters that just refuse to stick and that we keep forgetting over and over. The best way of learning tricky characters in Chinese is to deal with them decisively. For more about how to do that, check the first article in this series. 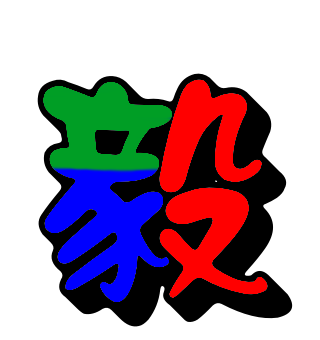 Depending on whom you ask, this is either an associative compound (a hand 扌 pressing 印, altered to 卬 in the modern character) or a phonetic-semantic compound with the same components (卬 is read “áng” and 印 is read “yìn”). This character is the same in simplified and traditional Chinese. This character is hard for a number of reasons. The first is that regardless of how the character was formed, neither explanation is very transparent because one of the components have changed. This means that there are clues, but they are indirect. Second, the right part is similar to several other components, including 印, but also 卯 and 叩.
Practise writing the character using the scratchpad! This is also a left-right compound. The left part, 豸, is one of the Kangxi radicals and has numerous definitions, including cat, badger, legless insect and mythical animal. This might contribute to making it harder to remember; I suggest sticking with one of these! 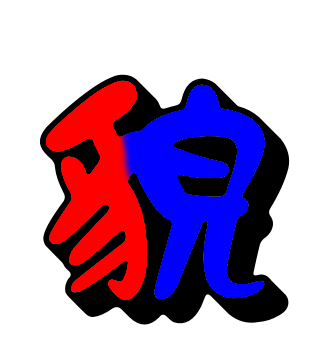 The right part is 皃, which means “countenance”, but which seldom appears in characters. Neither of these appear as characters on their own in modern Chinese. It’s also used to mean “aspect” in grammar, so 完成貌 is perfective aspect. Both components are tricky but for different reasons. The left part is tricky because it can be confused with numerous other animal components, especially if you don’t use one single and distinct image for each. For example: 犭, 豙 and 豕. The right part is very unusual and easily misrepresented as 見 or perhaps 竟. This character is actually my family name in Chinese (my Chinese name is 凌雲龍), so I won’t forget it even if I don’t write any Chinese for the next 50 years, but I understand that it can be difficult for other students. The character is an obvious phonetic-semantic compound (夌 is also read “líng” and means “to dawdle”). 氵 is one of the forms of water, 水. Worth noting is that 淩 (with three drops of water) is also an existing character, which means the same thing but which is less common. You should almost never use this character instead of 凌. Personally, this created some problems when I lived in Taiwan, because my bank account was incorrectly registered with three drops of water instead of two. I remember having problems with this character when I first learnt to write my name in Chinese. I also sometimes mix up similar characters, especially because of similar components on the right, mainly 夋.
That’s it for today! Do you find these characters difficult? Have you developed good mnemonics for than? Or do you have a question? Leave a comment!